Niche line Bond no. 9 has launched I Love New York for Holidays. 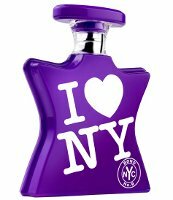 It is the 8th fragrance in the I Love New York series created in collaboration with the state tourism agency of the same name. New York-centric Bond No. 9 has created the perfect sensory souvenir for visitors: I Love New York for Holidays, an irresistible Empire State-centric eau de parfum. The notes include tangerine, blueberries, plum, freesia, osmanthus, sandalwood, white amber, teakwood, vanilla gelatto and musk. Bond no. 9 I Love New York for for Holidays is available now at Saks, in 50 ($105) or 100 ($175) ml Eau de Parfum. Right — that would have been perfect! But I guess they weren’t going for any particular holiday? Why not I Love New York on (fill in the date)? They could have 365 new scents (366 for Leap Year). I haven’t been enchanted with any of Bond’s scents and I just can’t keep up with them. Ha! There are supposed to be 15 in this series when they’re all done, and that should be plenty. What is it with purple today? 5 guys at work wore purple (I don’t think a memo went out)…and now this bottle. The juice sounds like it could cause instant toothache and this comes from someone who likes sweetish perfumes! Oh and don’t get me wrong, I do like purple and one of my nieces is a purple princess and I usually get her purple themed stuff.